Humans have been using the kayak as a vessel for fishing since well before your mother-in-law was born. But with fishing, the only traditions that stick are the ones that land the fish. For the past twenty odd years, the real pros have thrown away their paddles in favor of vessels that they can propel with their feet. The Hobie Pro Angler 12 was the first—and is perhaps the foremost—pedal drive kayak to make that a no-brainer. It's a great boat for many reasons we'll discuss here, and we're happy to score the Hobie Pro Angler 12 a solid A. Way back in 1997, Hobie engineers drew inspiration from the shape and motion of cetacean flippers and how they propel whales through the water. ‘Maybe we can do that with a kayak,’ they thought. They were right. The Mirage Drive 180 is by far the most famous of the Pro Angler’s features and one of the most popular as well. Here’s how it works. As a fisherman or fisherwoman sits in the captain’s chair, they rest their feet on two pedals that move straight forward and straight backward. Underneath the hull of the boat sit two flipper-like pieces. As one pedals back and forth, the two flippers swing side to side in a manner that propels the boat forward. The drive produces a lot of thrust, which is much appreciated for a boat the size of the Hobie Pro Angler 12. When it comes to storage, the Hobie Pro Angler 12 will not be found lacking. As the fisher sits in his kayak, a rectangular twist and seal hatch sits immediately before him. The lid will definitely keep off the rain, but we don’t recommend anyone stick all his important documents inside and send it down a C4 rapid. Past the fisher’s feet is another larger closed hatch. There’s a liner inside that can be removed or filled with gear or beers on ice. Immediately behind the captain’s chair is a large, open storage area crisscrossed with bungies. Toward the stern within this open area lies another circular twist and seal compartment. The kayak also has 2 H-Rails on either side for mounting any accessories, not to mention a 3-way connector for Lowrance Ready, Thru-Hull Wire Plugs so a fisher can find fish, the Monster of Loch Ness and the Red Oktober. Two molded in vertical rod holders sit behind the captain’s chair. Attachments on the H-Bar also allow four places for vertical rod storage. The profile of the Hobie Pro Angler 12 measures a full 12 feet in length and 36 inches in width at its widest. That makes for a real stable ride: many competitors are a full three inches skinnier. When it comes to weight, however, this kayak isn’t going to win any competitions. The hull itself is 105 lbs. Fully rigged, it’s somewhere closer to 130 lbs. Part of that reason is that the boat has a crazy weight capacity: 500 lbs in total. The captain’s chair can hold a full 350 lbs. Many bigger guys simply don’t feel as comfortable in comparable kayaks. Speaking of the chair, branded in the Hobie world as Vantage Seating, it’s wicked adjustable and it’s going to support the heck out of any fisher’s lumbar region. To steer, toggle a switch at either side which is connected to the rudder hanging off the stern. A drop down skeg allows for solid tracking and great stability for stand up fishing. It's just a great additional feature that speaks to Hobie's history of producing seaworthy craft. Another perk that we get excited about is the sail mount beyond the Mirage Drive. Sure, you’ve jerry-rigged some real doozies out or paddle and your rain jacket when a strong tailwind starts picking up, but it’s just not the same as having a proper sail. For any fisher who has decided that the time has come for a pedal drive kayak, the main variable left to decide is which kind of drive. We will compare the Mirage Drive with other forms below, but for now, we’ll focus on its pros and cons more generally. On the pro side, getting around with the Mirage Drive is really efficient—far more so than the traditional double-bladed paddle. Your legs are stronger than your arms, and if you angle the captain’s chair just right, you can really target those hard-to-reach lower abs. Another plus: when fish see water dripping from a paddle and it’s not raining out, they know something’s up. No paddle; no dripping. ‘But won’t the flippers get moved around all over the place when you’ve built up any speed?’ asks the crusty fisherskeptic. No, when no pressure is applied to either pedal, both flippers align in the middle and point straight down, creating minimal drag. As a plus, this acts as a kind of centerboard and allows you to easily track a straight line through the water. ‘But won’t they get caught easily on reeds or in shallow water?’ asks the crusty fisherskeptic. No again. By pushing either pedal all the way forward, the flippers flatten out and hug the hull of the boat, allowing for a little bump and grind without incurring damage. And as every good fisher knows, there aint nothing wrong with a little bump and grind. For years, a primary complaint about the Mirage Drive was that it didn’t let you pedal backwards. But as the folks at Lancaster County Marine discuss, the Mirage Drive 180 (new in 2017) solved that problem. Now, anglers must simply pull a cord running along the bottom of the seat compartment, and the flippers will swivel 180 degrees. Release the cord, and you’re back to pedaling forward. The fact that the two flippers of the Mirage Drive run vertical when you stop pedaling also shouldn’t be overstated. The help with tracking—especially on a windy day—saves a lot of headaches. When you catch that wind with a sail, it also helps you keep an even keel, so to speak. Just about any dedicated angler is going to prefer rails to mounts. There are times when you want to have your gear and your gadgets easy to access. There are times when you want to move them out of the way. And there are times when you want to turn up your radio, lean the captain’s chair back and put your feet in the water. 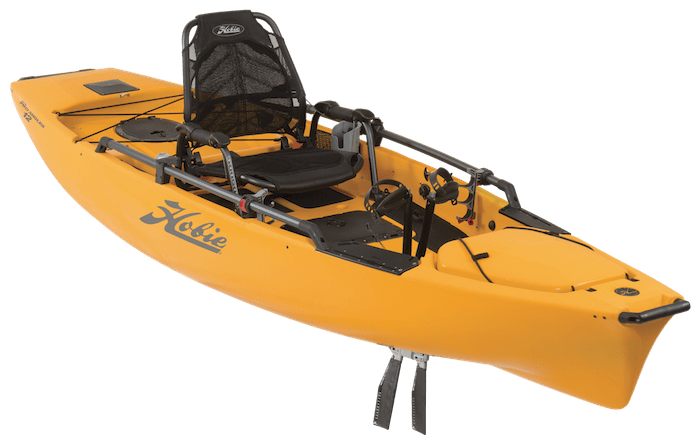 But as most kayak fishers know, there are rails, and gadgets that mount on them easily, and there are Hobie rails that accept only Hobie products. Sure, the company makes an incredible boat. They have also based their kayaks on the printer inkjet model and their accessories only fit their rails. BUT the company also offers universal mounting plates that can hold just about any accessory. It’s just one more thing to buy. One of the crowning achievements of the Pro Angler 12 is the way it carries itself on the water. By and large, it is one of the most stable pedal drive kayaks of its size around. This is not the work of one miracle feature, but instead, a complex harmony sung by a chorus of voices. For one, the width is above average. The boat also has a blocky shape. The pedal drive flippers stick straight down when out of use. There’s an additional skeg, or centerboard-like contraption that can be lowered for better tracking or increased stability. For those with a compromised inner ear, there’s even a bar that can be installed with the rail system (the H Bar) which can be leaned against or clutched at when you have a ‘we’re gonna need a bigger boat’ moment. As a Hobie-sponsored YouTube reviewer demonstrates, one can easily fish standing up facing directly off either side, a notoriously tippy position. Keep in mind, stability on flat water is not the same as choppy or ocean conditions. Aussie YouTuber Corey Knogg capsized his Pro Angler on the ocean after the weather went from fair to very foul very quickly. Still, compared to the competition, it’s about as stable as they come. The Mirage Drive 180 pedals like a dream in both directions and provides for good tracking and balance. Storage is on point. The Pro Angler has not two, but three covered compartments. The rails make this vessel exceedingly customizable. The boat is wicked balanced. It has a great total weight capacity. This kayak is NOT cheap. The H-Rails and accessory situation is one step away from the printer inkjet model. See our Hobie Pro Angler 14 Review. The most salient point of comparison for the Hobie Pro Angler 12 lies in the pedal drive. Most, if not all other pedal drives use a different technology which involves a bicycle pedal-like system hooked up to a propeller. The Native Slayer Propel 13 marks one such example, as does the Perception Pescador. To paint in broad strokes, these kayaks are cheaper than the Pro Angler, and they can more easily pedal backwards (no cord-pulling required). On the other hand, the Mirage Drive does better in shallow water. You won’t get reeds or line tangled endlessly around the flippers. It makes the boat more stable. It helps the boat track better at speed. It is more efficient. In other words, if you’ve got the cash, you’ve got a lot of reasons to seek out the Mirage. On the other hand, many fishers are just as happy with either technology. See our Native Slayer 13 Review and our Perception Pescador Pilot 12 Review. The Hobie Pro Angler 12 was one of the first of its kind and it might just be the best of its kind. It excels when it comes to the pedal drive, stability, and storage space. Unfortunately, with great features comes great financial responsibility. This is one of the top-of-the-line kayaks, and its price reflects that. While it’s going to cost you even more to add Hobie accessories, you’re going to be sitting on the current forefront of pedal drive kayak fishing technology.